Fantasy Football Librarian: December is here! I heart December. There's just something about the festive holiday mood that makes everything a little bit better in December - and now that we're in NYC, I think that's going to be magnified (hello, giant tree in Rockefeller Center, you better believe I'll be coming for a visit). Toss in the fact that football is getting serious and what's not to love about this month? The end of November means the end of my 1st Annual FFLibrarian Readers' Choice poll. I'm hoping to have the results pulled together for you all by the end of the week. Stay tuned! 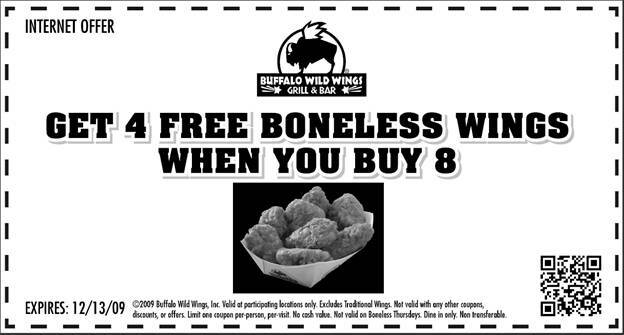 Meanwhile, keep the comments coming on the BWW All-Star Blogger League site for a chance to win a $50 gift card to BWW- and in the meantime, Buffalo Wild Wings has graciously offered up the coupon for free wings that you see below at the bottom of the post. And I've got more treats coming from BWW soon, too...plus I'm working on setting up a Thursday Night Football game watch in the next few weeks at the Brooklyn BWW with the first $100 of drinks and food covered by yours truly/BWW. I'd love for any of you in the area to join in on the fun, so again, stay tuned! My current fantasy crush is Justin Forsett. The dude is awesome - check out the love that his o-line gives him in Roto Arcade's 7-on-7. Forsett has a 5.6 yards per carry over the past 5 games and his yards per catch are at a nice 8.7 (data pulled from FFToday). Not too shabby. His numbers put him at the #10 fantasy RB spot for the past 5 weeks and as the #2 fantasy RB if you look at just the past 3 weeks. Hot. stuff. If you're wondering whether your studs will play during the fantasy playoffs, turn to Rotoworld's Will They Rest? for some early thoughts. SI's Fantasy Clicks: Week 12 Revelations is full of great details from this past weekend's games. Always a good read. For a stroll down memory lane, see what the Mac Bros have pulled together in The All-Decade Fantasy Football Team. Let's say you read today's post and you're still on the hunt for more links. Well then scope out Fantasy Football Hub's Table of Contents, nicely divided by fantasy topic. Finally, tonight I will be on the radio with Ryan and Jeff on Fighting Chance Radio - being that it's Ladies Night on their show, it does seem rather appropriate that I'll be chatting with them starting around 10:15 or so eastern time. Thanks for the cupon. I'm jealous about the potential of a BWW football watching party with fellow readers of my new favorite FFL blog (especially if part of the tab is getting picked up). But I'm not exactly in the neighborhood. I suggest if its a hit, you take the act on tour. "Coming to a BWW near you... the FFLibrarian thursday night football watch!" It could catch on!